Hi, you show a toner for a Samsung ML2510D3 but mine is just an ML2510. Will this cartridge fit mine too? This price looks European, how much is it in U.S. Dollars, and where do you ship from? Thanks. Cartridge Save is based in the United Kingdom so we only deliver within the UK. The part number ML-2010D3 belongs to one of the cartridges that will work in the Samsung ML-2510 printer but we can't guarantee that any of our cartridges will work in non-UK printer models. Delivering large amounts, the efficient Samsung ML-2510 makes sure you’re always ready to start a period of high volume printing. High volume printing with your Samsung ML2510 can become expensive as accessories such as the black Samsung ML-2510 toner cartridge are pricey and in high demand. We at CartridgeSAVE are committed to keeping your ML-2510 costs as low as possible-you can compare our cheap Samsung ML-2510 toner prices with other Samsung ML-2510 cartridge suppliers to find out. We have a wide range of Samsung ML 2510 toner cartridges to choose from and we’ll make sure that you’re able to get your Samsung ML2510 toner at a discount price! Our ML-2510 toner cartridge prices are already incredibly cheap, but that doesn’t stop us from adding free delivery to the Samsung ML 2510 toner package. You can buy the cheap Samsung ML-2510 cartridge in a few quick easy steps, ensuring you waste as little time as possible. We also send the ML 2510 toner cartridge off with an iron clad money back guarantee so you can be certain that you’ll only receive quality Samsung ML-2510 toner from us. The Samsung ML-2510 toner printer is a network-ready monochrome workgroup laser printer that Samsung sells well below market prices. In other words, this is an excellent option for the small business on a tight budget, but it's also quite suitable for the home user willing to splurge a little. When we think economy, we sometimes associate that with cheap, but that isn't the case here. The ML-2510 is a premium laser printer that produces high-quality text at 1,200 dpi at a rate of 24 pages per minute. There are some sacrifices to achieve this price level: it doesn't support duplex printing, it only supports the basic paper sizes and it has a relatively small capacity for office use at 250 sheets. Samsung uses a basic office style for the ML-2510 with a reserved two-tone colour scheme: light grey and medium grey. But don't mistake reserved for ugly. This machine uses angles and rounded corners to great effect for a style that is appealing but doesn't stand out. It also has a small footprint compared to most office-oriented printers, and although it's likely too large for a workstation desk, it doesn't need a dedicated space, and you shouldn't have much trouble finding a convenient spot for it. Consumers should note that Samsung has taken a minimalist approach with the on-board control panel, so you must access the finer options through the software interface. The greatest advantage to the ML-2510 is that it meets the demands of the small and medium offices at the price of laser printers intended for home use. It is also completely network-ready, includes software and drivers for Windows, Mac OS X and Linux, has high-speed USB ports, and even has a parallel port for legacy configurations. Another important aspect of the ML-2510 is that the Samsung ML-2510 toner cartridges yield 3,000 pages, and Cartridge Save the Samsung ML-2510 toner cartridges at prices that are competitive with cartridges that yield only 2,000 pages. 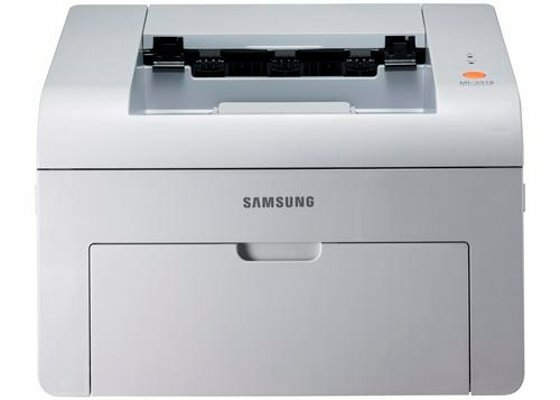 The biggest drawback to the Samsung ML-2510 is that it doesn't offer duplex printing, which is a prevalent need in office environments. Of course, you can print to two sides manually, but this is a big inconvenience for jobs of any substantial size. Another issue is the drawer size, which is only 250 pages. That capacity in and of itself isn't an issue; it's that Samsung offers no way to upgrade the machine. That's unfortunate since many offices need to print much larger jobs unattended, and those businesses may need to look elsewhere because of a lack of upgrade option.